Douglas Branch rapid transit terminal providing fully accessible sheltered train platform and bus transfer with enclosed station house and fare collection areas. Materials include architectural concrete, masonry, metal panels, glass and stainless steel. 1,300 ft long station structure separates in-line arrival and departure rail platforms to the north and bus drop-off and boarding berths to the south. This allows transfer between modes without crossing tracks, maximizes passenger safety and convenience. 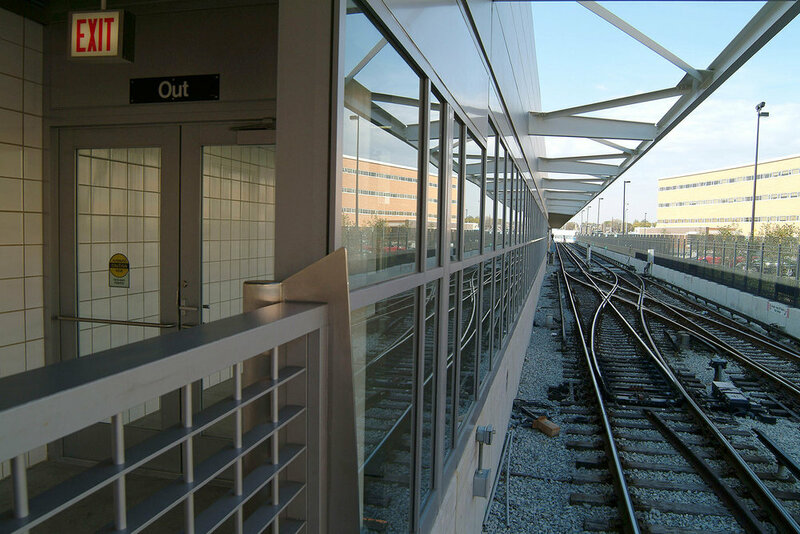 A curvilinear 8' high decorative metal guard extends the length of the station and defines paid and unpaid areas. Alternating sheltered concave sections provide bus and rail passenger waiting along the length of the station.